The American Revolution took place between 1765-1783. The British has control over the colonists in which they took a lot of advantage of. such as mercantilism and the British were ripping off the Colonists and making their life financially no good. 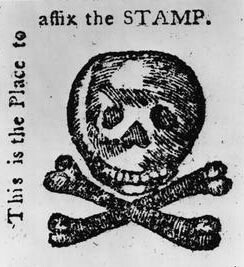 The stamp act had a big cause of the american revolution because the Colonists refused to pay the tax collectors in who they owed. The same thing happened in the Lake Of Representation In Parliament "Taxation Without Representation". Where the Colonist once again did not pay for the war that they were being taxed on. 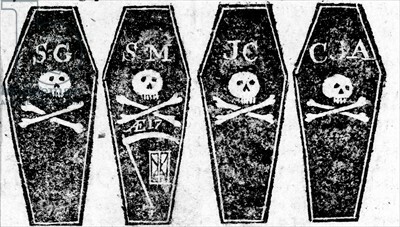 A war they had nothing to do with, did not involve them. 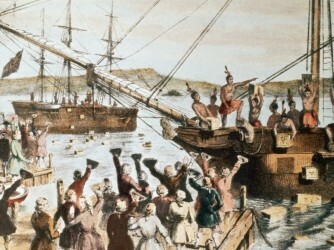 The Boston tea party is what really mad everyone want to go to war for the colonists wasting all that money for the tea that was important to the British. What do i know about this video? By watching this video you should be able to complete the following questions and answer them. How many historical events can "one shot heard around the world" relate to? What started the American Revolution? Which military had more power, american or britian? 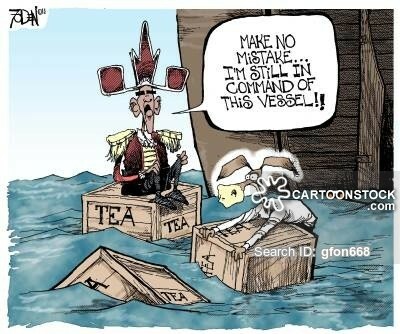 This cartoon explains that the leader gets blamed for all his citizens mistakes. 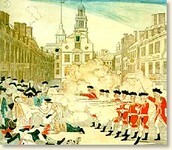 What was an important event in the american revolution? Who fought against each other?